There is an extensive education programme within the Corps that enables Marines to undergo academic and vocational qualifications at minimum cost. The Royal Marines uses the LANTERN framework to assess and accredit the literacy and numeracy abilities of personnel because set standards have to be met in order to be eligible for promotion or transfer between specialisations. LANTERN standards for "Literacy and Numeracy Testing and Education in the Royal Navy" and delivers nationally recognised Skills For Life qualifications. Anyone considering joining the Royal Marines will attend the Potential Royal Marines Course and as part of this will sit a Skills For Life Initial Assessment to determine the level at which he is currently working. A minimum of Entry Level 3 is required to to join the Corps and other standards have to be met subsequently. In particular, Marines must reach Level 1 within 3 years of joining or before promotion to Corporal and Level 2 is required within 8 years or before promotion to Sergeant. Appropriate equivalent qualifications can be used instead and successful completion of the Key Skills programme undertaken by Recruits during their training at the Commando Training Centre will mean that they already meet the educational requirements for promotion to Corporal. Support for the LANTERN system and help in gaining Skills For Life and other qualifications is available from Education Officers, both at home and when on deployment, and from Royal Navy Learning Centres within Units and their dedicated Basic Skills Tutors. 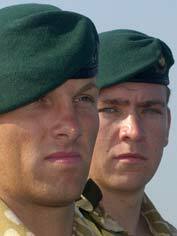 The Royal Marines are actively encouraged to continue their education after joining the service. All Marines receive a Personal Development Record to help document their goals and progress and they are supported by 2 educational allowances. The first is the Standard Learning Credit, which gives them £175 per year towards the cost of any education course, such as GCSEs they need for promotion, language training and computing qualifications. The second, The Enhanced Learning Credit Scheme, offers up to £6000 for educational and vocational courses at higher levels. Royal Naval Educational Officers provide advice, support and guidance on all forms of education, including on line learning, the provision of classes in Learning Centres and the opportunity to work towards and undertake examinations, even while on deployment. All Marines complete a programme of Key Skills leading to a Public Services Apprenticeship and are encouraged to achieve recognised Skills for Life qualifications, and Royal Marine Training is accredited by civilian institutions. The Corps Library supports command courses and officer training, along with current affair bulletins. University Short Courses covering subjects like Management, Politics and International Relations are also available free of charge. Marines can call on specialist help with Specific Learning Difficulties if necessary, and the recently established Defence Learning Portal provides access to Europe's largest e-learning programme, with courses continually being added. Joining the Royal Marines means becoming part of a service that values education and engerders a culture of life long learning as part of the Corps ethos.